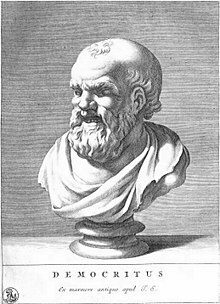 Democritus (/dɪˈmɒkrɪtəs/; Greek: Δημόκριτος Dēmókritos, meanin "chosen o the fowk"; c. 460 – c. 370 BC) wis an influential Auncient Greek pre-Socratic filosofer primarily remembered the day for his formulation o an atomic theory o the universe. ↑ The idea that atoms an void as the fundamental constituents o the warld (DK B125: "ἐτεῇ δὲ ἄτομα καὶ κενόν"). This page wis last eeditit on 28 October 2015, at 22:00.